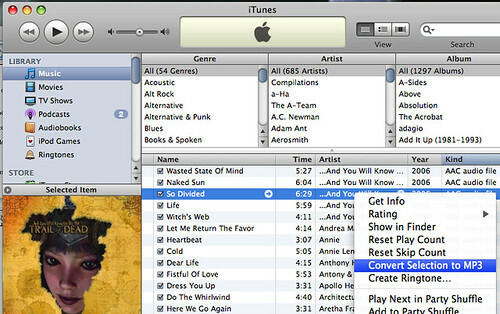 iTunes is much more than a digital music jukebox. It’s capable of handling many different tasks involving digital media. Some of iTunes’ most popular features include buying music and vidoes online, burning CDs, and syncing files with your iPod or iPhone. But one of the lesser known functions hidden within iTunes is the ability to convert audio files. You have an AAC file in iTunes that’s not compatible with your Zune that can play MP3 and not AAC files. A WAV file needs to be emailed to a client for approval but it’s too big. You need to convert the file to an AAC so it’s small enough to easily send via email. You are making a music video and want to use a song you got online as the soundtrack. However, the editing program won’t import the song because it doesn’t support MP3 or AAC. You need to remove the DRM (Digital Rights Management) from an AAC song you purchased from the iTunes Store (see step #7). Many programs that convert audio files into different formats are pretty complicated and usually cost money. But not iTunes. iTunes is simple, fast and best of all… free.